Art and math is great combination, as the two areas overlap so much. 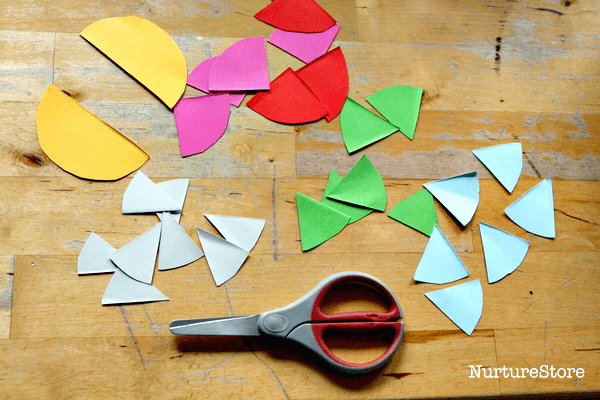 When we’re learning about shapes are we working on math concepts or art ideas? Both of course! 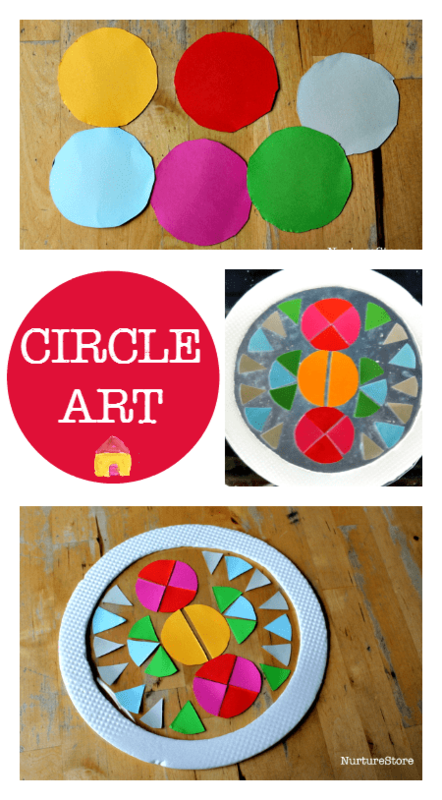 Here’s a colourful suncatcher idea that plays with circles. We started our shape art project by cutting out some circles from coloured card. 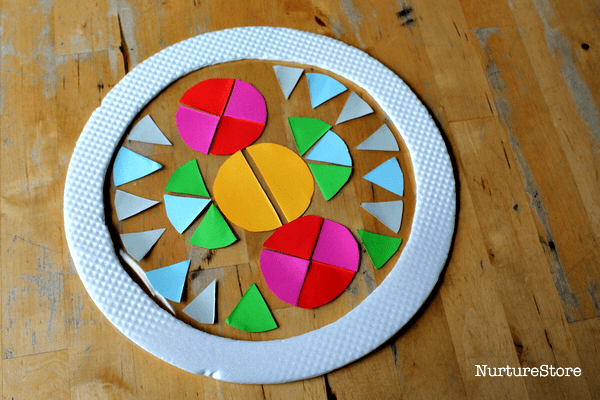 I have one daughter who makes cutting out circles freestyle look so easy, but my other daughter and I need a circle to trace round. 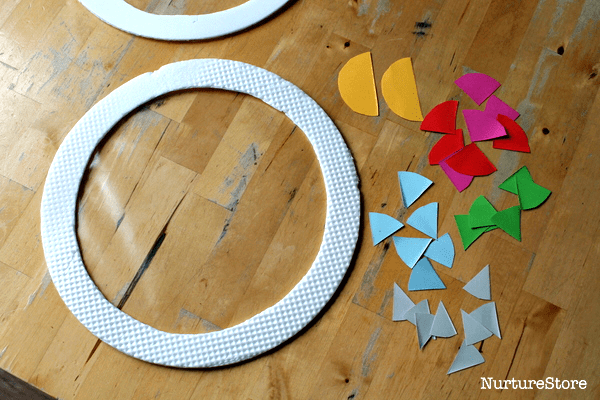 Either way, cutting out circles is great practice for scissor skills. Next we played around with folding the circles to see what shapes we could make. 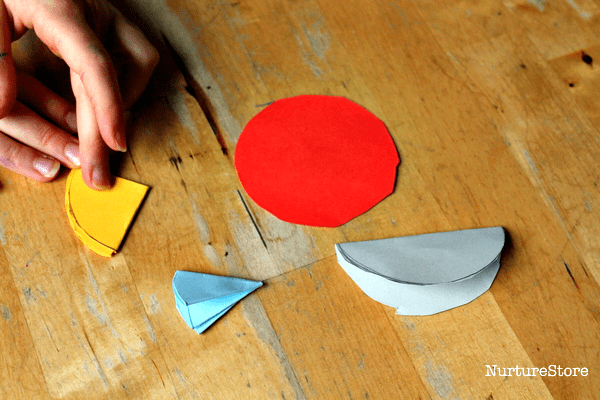 What shapes appeared when you fold a circle in half? In quarters? Is it easy to fold into sixths? What are all the shapes called? 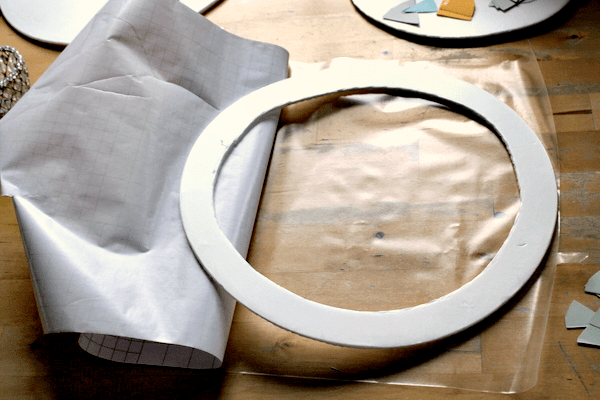 Then a bit more scissor practise, cutting out a variety of smaller shapes from our folded circles. A quick hunt in the junk model box revealed some more circles: the bases from some pizzas. We cut out the centre to give a circular frame. (You can use cardboard or a paper plate for this too). And then we stuck some sticky-baked plastic / contact paper across the frame to give a sticky canvas. The great thing about contact paper is that you can place items on it, peel them off, change the patterns, and make different designs very easily. 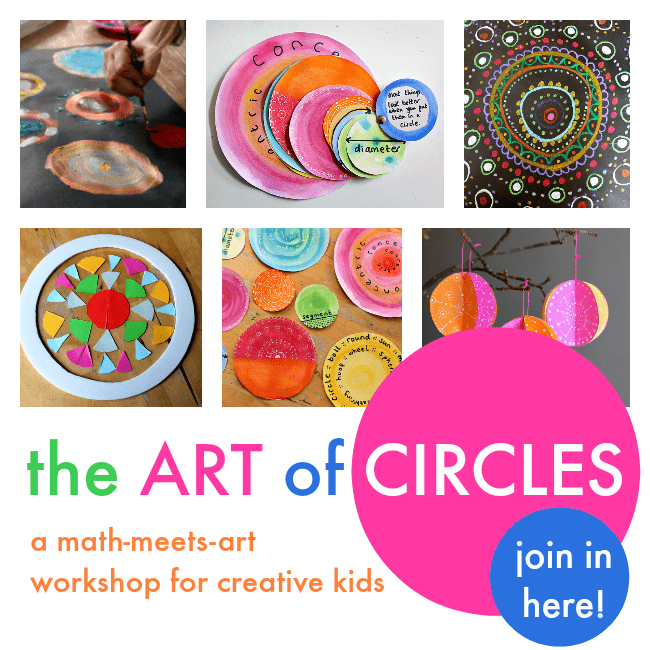 It’s great for exploring shapes and patterns, and creating mandalas. 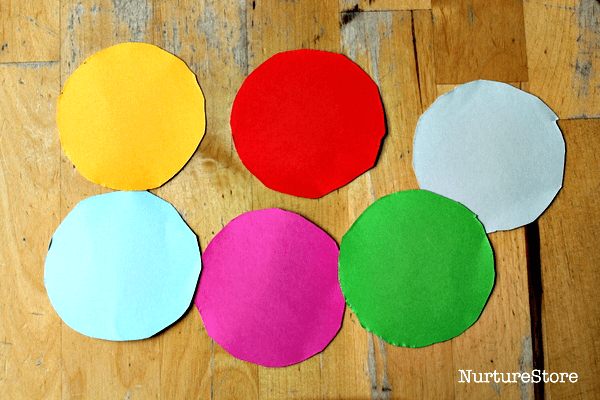 We played around some more, making these colourful circle designs. 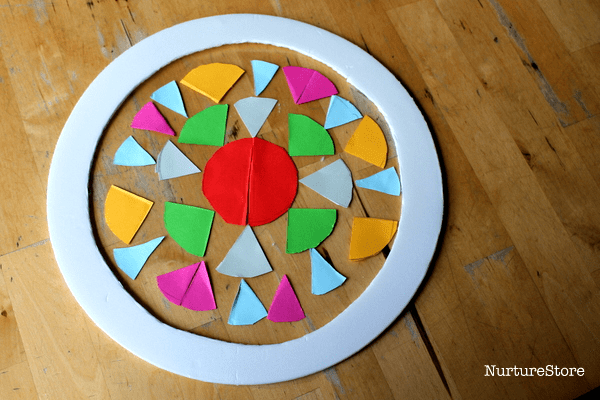 You can incorporate symmetry if you like, dividing your circle in half along a diameter and making identical designs on either side, or you can create several radial lines of symmetry (like a snowflake). 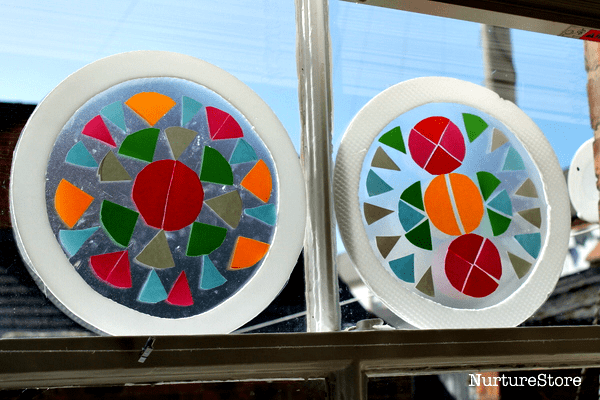 You can form new circles from the smaller shapes you’ve cut out, repeat colour patterns around the circle, and make some beautiful suncatchers to display in the window.